Bio Green of Orlando has earned the service industry’s coveted Angie’s List Super Service Award, reflecting an exemplary year of lawn care services provided to members of the local consumer review site in 2015. “We are really proud to have earned this award two years in a row. We truly value our customers.” says Rob Hendricks, owner of Bio Green of Orlando. 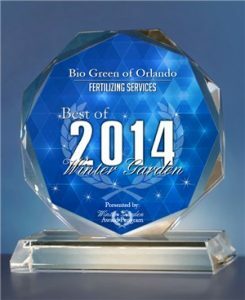 Bio Green of Orlando is a locally owned and operated professional lawn care company providing Bio Green natural fertilization services utilizing patent-pending natural fertilizer products by Bio Green USA for Lawns, Shrubs, Trees, Flowers and Gardens. Bio Green Orlando is equipped to handle natural fertilizing treatments, weed control, insect control, disease control and full-service pest control needs for residential and commercial properties. Our service area includes Orange, Lake, Seminole, and Osceola Counties in Central Florida. 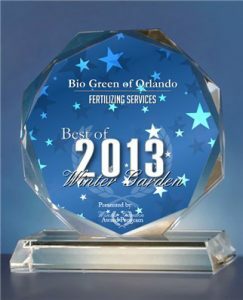 Bio Green of Orlando Receives 2014 Best of Winter Garden Award in the Fertilizing Services Category. 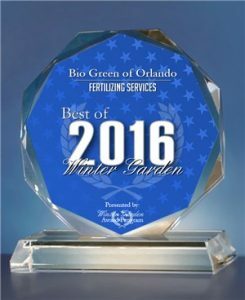 WINTER GARDEN May 15, 2016 — Bio Green of Orlando has been selected for the 2016 Best of Winter Garden Award in the Fertilizing Services category by the Winter Garden Award Program. Each year, the Winter Garden Award Program identifies companies that we believe have achieved exceptional marketing success in their local community and business category. These are local companies that enhance the positive image of small business through service to their customers and our community. These exceptional lawn care companies help make the Winter Garden area a great place to live, work and play. Various sources of information were gathered and analyzed to choose the winners in each category. The 2014 Winter Garden Award Program focuses on quality, not quantity. Winners are determined based on the information gathered both internally by the Winter Garden Award Program and data provided by third parties. The Winter Garden Award Program is an annual awards program honoring the achievements and accomplishments of local businesses throughout the Winter Garden area. Recognition is given to those companies that have shown the ability to use their best practices and implemented programs to generate competitive advantages and long-term value. The Winter Garden Award Program was established to recognize the best of local businesses in our community. Our organization works exclusively with local business owners, trade groups, professional associations and other business advertising and marketing groups. Our mission is to recognize the small business community’s contributions to the U.S. economy.